Indian Wells: best tennis, best location, scary windmills. But you can't get away from the cache of the location and that location is Indian Wells, one of my favorite places on earth. Whatever you call the event, it's one of the greatest experiences you can have in the world if you love tennis. Let's not name names, but I can't really say the same about many world pro events I have attended over the years. And now let's get to the point of the article. Are you joining this year's exodus of hundreds of Tennisplayer subscribers to the holy shrine of desert tennis? And if not, I must ask you, why not? 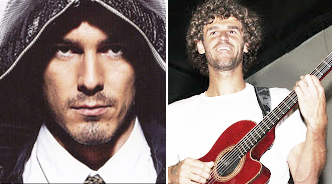 Marat Safin and Gustavo Kuerten: two very different presences in a hotel bar. Or let me say why. In the ten years we've built up quite an archive of fascinating sightings, sites, and indelible memories. Isn't it time you did the same? Or added to the ones you have? A few of ours that come to mind: Marat Safin in a hotel bar drinking straight vodka talls, surrounded by several fancy women who appeared completing unconnected to tennis and then all of them retiring to the outdoor patio to smoke unfiltered cigarettes. Or Gustavo Kuerten, in that very same bar, playing acoustic guitar and singing sweet Portuguese folk songs, with the presence of a rock star. Or a former male tour player, talking far too loudly on the media area lawn, telling a much more successful female player of his intense feelings, and the precise physical acts by which he would express them to her. And yeah, there are a few (way more than a few) purely tennis memories in there too. Seeing Roger Federer play on the outer courts in front of a few hundred people before he ever won Indian Wells or a Slam. Seeing Justine Henin at the same point in her career, on the same court, hitting a dozen double faults with her pinpoint service stance. Then watching Carlos Rodriquez change that stance using our high speed footage of Pete Sampras as his model. The last of the infrared: well spent on Rafa and Roger. And more recently (and this is somewhat tennis related) watching Tennis Channel personality Danielle Dotzenrod making fresh fruit tequila drinks for our crew while paddling around in our heated swimming pool at the Tennisplayer house in Palm Springs. That was a new strategy for us last year, not just drinking Danielle's margaritas, but the move to a house historic old Palm Springs. We also ended up one night for dinner at one the great classic French restaurants you will ever visit—both in terms of ambience and food: Le Vallauris. And in Old Palm Springs we were probably the only people there from the tournament. 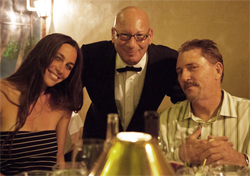 Do Danielle and I look happy with our sommelier, Michael? It's one of those places where you can put yourself in the hands of the waiter and the sommelier and trust them to steer you to the best choices on the menu for that evening—a mix of classic and specials--as well as to recommend a bottle or two of French wine in your price range. (And if you have a thousand dollars to spend on wine, they can help you.) Once he found out who we were, Michael, the sommelier, spent some time with us discoursing on his own tennis career and views on the tour. That's me with him and Danielle at one end of our table. Do I look happy? But enough about the treasures of old Palm Springs—back to the BNP Paribas Open. (There I said it again, Matt.) One of the most totally stand up elements about the event that actually shames every other event on the tour is the use of the Hawk Eye instant replay system. 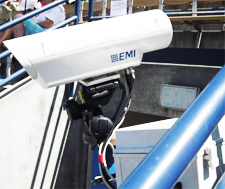 Look around on any match court—you'll see 8 Hawk Eye cameras like this on every one. Indian Wells has 8 match courts. And guess what? Hawk Eye is on everyone. Should it really be any other way? No it shouldn't, but no other event comes close—that's more than the Open and Wimbledon put together. Well, there are a lot of things in tennis that should be different than they are—and one of the most controversial is prize money. If you follow the tour closely, you know that the percentage of gross revenue allocated the players is shockingly low compared to other professional sports. The NFL for example, like pro baseball, basketball, and hockey, shares 40-50% of the gross with the athletes. Want to guess what it is in tennis? How about at the world's largest event, the U.S. Open? 50 percent? 25% percent? Nope it's 12 percent. Correct! This is why the players in the lower half of the top hundred are basically disposable. A first round loser at Indian Wells currently gets $8,000—and that's at the tour's high end. But the admirable point here is that it is Indian Wells and CEO Ray Moore who are leading the way again: Hawk Eye, the money—and these things on top of already having the best venue in the world for seeing the top players at very close range. Beer with Brad and the Corona Hostesses. No lime for me though. This year they've added a few less significant, but possibly entertaining elements—from the sociological perspective if no other. For the first time, the Tennis Channel will have a live desk just outside the main stadium where you can observe the commentators first hand, as well as watch the interviews—and if you must, jump up and down and wave to the camera—yes it can be that exciting. Then there is something called “Beer with Brad” on the first Friday of the event March 8. This is your chance to interact, not only with Brad, but with the Corona Hostess girls at the Corona Bar in the plaza. Or at least stare at them. I'll be there for that one, but please if you insist on buying me a beer, no lime. Finally, there is something else which is actually phenomenally cool—a pre-qualifying tournament that anyone can enter. Yes anyone, and that includes you. The entries are first come first served, so to speak, with 128 spots in the men's draw and 64 in the women's. That starts on March 2. I was told by the tournament staff that they haven't filled the draws in previous years, so there really is a chance you could be crushed by a young player who goes on to become number one in the world. How many players can claim that as a memory? Madison Keys: from prequalifying to the top 100. Last year Madison Keys actually won the tournament, and now she is ranked #82 on WTA computer. I know some of you out there are dreaming of a major upset when you get the chance you've always deserved at a tour star. Write in if that happens ok? So that's it. I have to go and start getting our photo gear together! Let me know if you are coming down—or just shout at me on the grounds if you see me. Check out our new Tennisplayer TV commercials too—they will be begin running during the Tennis Channel coverage!